Northeastern Thailand is known as a destination that is rich in diversed history and culture. It is famous for the natural attractions, historic sites and unique cultural activities within the region. The local's religious and culture have great influences by Cambodia and Laos, as Northeastern Thailand is next to the two countries. Now you can travel to the Northeastern region of Thailand and explore the beauty of this region with Sun Bus, which is a famous bus operator based in the north side of Bangkok. The company provides bus services from Bangkok, the Capital City of Thailand to Chaiyaphum, Khon Kaen, Loei and Nakhon Ratchasima located at Northeastern of Thailand. Booking a bus ticket to travel around Northeastern Thailand has never been easier now that you can do it on Easybook! Sun Bus offers bus services that travels from Bangkok Bus Terminal (Chatuchak) to Chaiyaphum which is located 330 KM away. Other drop points within the routes are located at Ban Khai, Ban Prang, Chaiyaphum Bus Terminal, Chatturat, Lahan, Non Chan, Nong Bua Khok and Phu Khieo. Besides the places mentioned above, Sunbus also offers return routes from Chaiyaphum to Bangkok. On top of that, Sunbus also provides bus services from Bangkok Bus Terminal (Chatuchak) to Chum Phae Bus Terminal of Khon Kaen with return trip. Travellers can also ride with SunBus if they would like to go Chiang Khan, Loei Bus Terminal, Nong Hin, Pha Nok Khao, or Wang Saphung (Loei) from Bangkok. The bus operator also offers passengers with return routes from Loei to Bangkok. Trips from Bangkok Bus Terminal (Chatuchak) to Nakhon Ratchasima (Dan Khun Thot Bus Stop) and its return routes are also popular among the tourists who are using SunBus. Passenger will definitely enjoy riding with Sun Bus as they come with adjustable and comfortable seats on board to ensure the passengers have a relaxing journey no matter near or far. Sun Bus also provides passengers with complimentary snack on board. 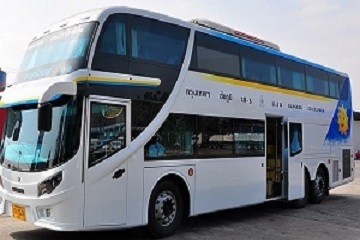 You can find single and double deck buses available when you choose to ride with Sun Bus, which are equipped with cooling air-conditioning systems. There are also individual television screens installed at the back of every seat for you to catch a show or two to help keep you company especially during those sleepless overnight journeys. Take note that Sun Bus only provides Wi-Fi services on selected buses only. Sun Bus has frequent stops for passengers to use the restroom or to buy some snacks during the journey. Now go ahead and book a Sun Bus bus ticket online at Easybook website or download the mobile app to your devices to purchase it within minutes.